I know spring isn’t the ideal time to share a chowder recipe, but we’ve had a bit of a cold snap lately with night temps dipping into the 40s, so I thought it was appropriate. Plus, this is a seriously delicious recipe. The secret to getting it thick and creamy is blending a few cups of it at the end of cooking and mixing it back in being careful not to burn yourself. As you probably already know, I try to keep my recipes as simple as possible, but the extra step of blending is worth it in this instance. I love soups because they are often inexpensive and a great way to sneak in lots of vegetables. I use my slow cooker almost anytime I make soup because it makes my life so much easier. Enjoy! Step 1: Add corn, potatoes, broth, herbs and spices to slow cooker. Step 2: Cook on low for 8 hours. Step 3: Remove 3 cups of cooked chowder from slow cooker and blend well being careful not to burn yourself. Step 4: Mix blended chowder back in the slow cooker. Step 5: Mix in cream and bacon bits before serving. What is your favorite slow cooker soup recipe? I’d love to know! Add corn, potatoes, broth, herbs and spices to slow cooker. Remove 3 cups of cooked chowder from slow cooker and blend well being careful not to burn yourself. Mix blended chowder back in the slow cooker. Mix in cream and bacon bits before serving. I love slow cooker meals. They are such a budget saver on those crazy nights. 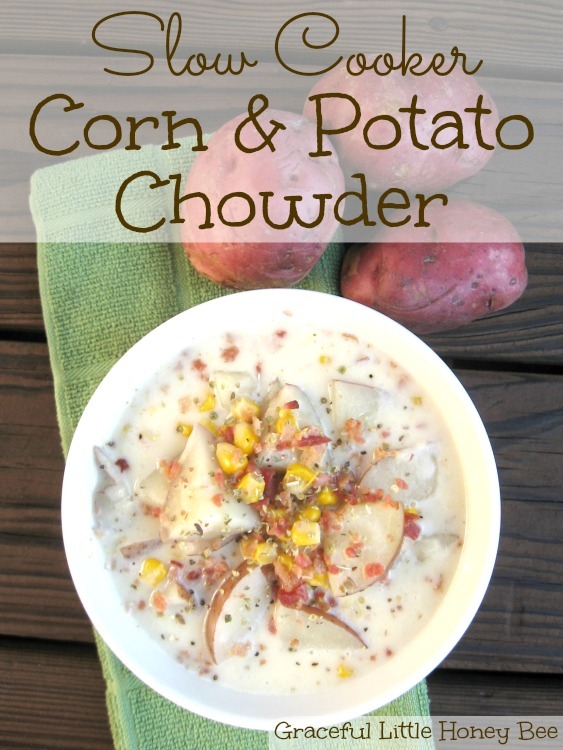 We do so many soups in our slow cooker, but I haven't tried a corn chowder. This looks like it would be perfect with some homemade rolls on a cool night. This really is a super delicious recipe. I hope your family enjoys it! It looks so good and easy...will make for sure this week ...Thanks for sharing. It's one of my favorite recipes. I hope you enjoy! How can I get recipe save to my computer or get cookbooks? I like easy recipes to do with grandkids. At the moment you will have to copy the recipes and paste them into a word document to print them, but I'm working on having printable recipe cards on the site in the next couple of months. Could I just use an immersion blender instead of taking out 3 cups and blending? I'm new to the immersion blender. Yes, you may use an immersion blender, but be careful not to run it too long because you want to leave lots of chunks. I prefer to remove it and use a regular blender for a better consistency. Just made this tonight and it might be the best soup/chowder I've ever had! Even when fall and winter have passed, this will definitely remain a staple.